I usually like mobile games that allow for slow or no-pace play. I might not have a ton of time to play at once, or I may be, uh, sitting down. Games like Bejeweled, Draw Something!, Organ Trail or even Candy Crush Saga usually fit my level of commitment. However, Sedagive?’s older son Gojira showed me a game that is so silly and fun it bent my usual rules: Quadropus Rampage by Butterscotch Shenanigans. Quadropus Rampage is available for Android and iOS. You take control of Tack, a four-tentacled Cephalopod who dives deeper and deeper into the ocean to smack bad guys in the face. Tack is accompanied by a starfish named Bingo, who occasionally spins around the board and damages enemies. The game is isometric in design, and you control Tack with a virtual thumbstick placed in the bottom left hand corner of the screen. It works well enough, although there’s enough slop in the control that I get very nervous whenever I am near a gap in a level’s floor. There are four buttons in the bottom right corner of the screen. You’ll be tapping the big green button a lot — this makes Tack swing his weapon. Underneath that is a black button that activates Tack’s squid ink, which quickly propels him a short distance. This also allows him to float over small openings. Two tentacle-shaped buttons gradually surround the two primary buttons. The upper yellow tentacle activates Tack’s smash attack, which the bottom light blue one activates a protective bubble that temporarily shields him from damage. Tack starts the game armed with a tennis racket. That’s right. A tennis racket. All of the weapons in the game are completely ridiculous. My favorite is the sloth-on-a-stick, but the Twitter bird-like one is a close second. The names, attributes and rarity of the weapons are randomly generated and that adds to the game’s snarky humor. The game is fairly challenging, and expect to die frequently and suddenly. I haven’t fully completed the game yet but one thing I like about the game is that as you level up it becomes easier and easier to get back to where you started from. Tack grows in strength due to his masteries and increased attributes, which makes dispatching enemies at earlier levels easy. 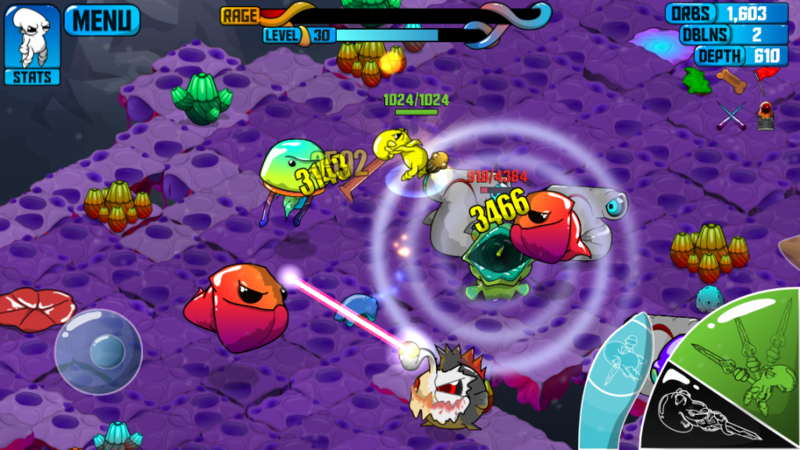 If you like action games you’re going to like Quadropus Rampage. I love the art direction, humor, and RPG elements. It’s just light enough to get me to play it a few times during the day, but not so light that I feel like it’s pointless or stagnant.